The development of modern IoT-connected products poses the challenge of integrated the separate, but parallel lifecycles of hardware manufacturing, software development, and service innovation. This eBook helps understand and better manage this challenge with the combination of a right management approach, and dedicated software tools. As product complexity increases, the integration of hardware engineering, software development, and service innovation lifecycles is a new management and technical challenge faced by a growing number of companies in various industries. Ensuring an efficient overview and the granular management of all processes is a difficult task. This eBook analyizes how these various intertwined lifecycles may be managed, and how they can be brought under one roof using codeBeamer ALM. 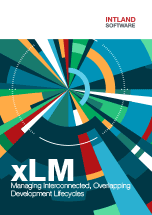 Have further questions about xLM? Feel free to contact us, we’re glad to help.